Spring 2007 will not be going down as special if you look at it in terms of the number of migrants recorded. It was another Spring which failed to produce any real movement by the traditional movers, such as Meadow Pipit or Linnet and even return migration by Fieldfare, Redwing and Starling was almost minimal. Visible migration counts were low and the poorest for many years, with the skies virtually birdless for days at a time. The fine weather meant ideal conditions for flight and no birds were really forced down by the hoped for inclement weather. This Spring will however be best remembered for the large number of the area's earliest-ever arrival dates by a total of seven migrant species. Only Reed Warbler was late out of the 24 regular Summer migrants here, although several species shown in the table below, only just made it back within the limits of their respective earliest and latest arrival dates. On the positive side, a total of three Redstarts (all males) was the best ever Spring showing here and the same number of Whinchats, was the best count for five years. 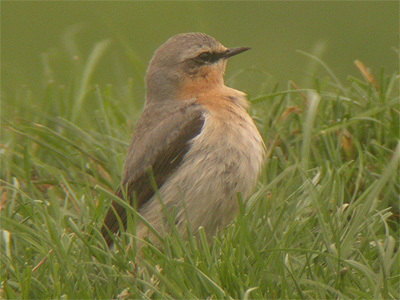 However, these fortunes were'nt shared by Wheatear - just two birds noted in April, being the lowest-ever Spring count and representing a considerable change in fortune after the record 30 recorded in April 2006. The lack of March Wheatear records, helped to show just how poor the month was for both migrants and visible migration counts as a whole. Even Meadow Pipits failed to produce a real peak and the monthly count of 227 was relatively ordinary, despite the lower amount of observer coverage. Two Tree Pipits in April (north over Kersall on 19th and north-west over Eakring Flash on 26th) were welcome records and it was another excellent year for Grasshopper Warbler. Fieldfare produced the highest visible migration figures of all species, including some very early (possibly genuine) return movement in January of 432 birds. Visible migration counts were virtually nil during February, but there were very large and early build-ups of both Starling and Fieldfare. Some 800 Starling were in fields near Parkhill Plantation/Eakring Field Farm on February 17th, with 350 there again on the 24th. Some east coast sites reported Starlings moving or building-up around this time and it seems that the mild weather induced an earlier than normal North Sea crossing. 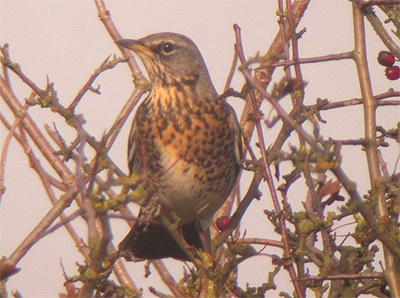 The same area also produced some staggering Fieldfare counts at the same time. 150 Fieldfare were present on 12th, rising to 650 on 17th. Near the end of the month, an estimated 1500 Fieldfare were present on 24th, but counts gradually dwindled after this date. Redwing was another species which was also present in very high numbers for the time of year, with a maximum of 250 in with the Starling and Fieldfare flocks on 24th. Visible migration counts increased again during March with a count of 118 Fieldfare through, with a near record 240 birds recorded in April. Low daytime movements/totals experienced for much of the period, were later to be explained during the first week of April and one of the few features of this Spring were the late evening/dusk movements noted by Fieldfare and smaller numbers of Redwing. This was noted on several occasions early in the month, but was best illustrated when 183 Fieldfare climbed high into the darkening sky heading north-east on 5th. The annually hoped for gloomy conditions failed to materialise this year. March did provide welcome records of single Redshanks over Eakring Flash on 20th and 25th and although much of April was graced with particularly fine, sunny weather there were records of two Ringed Plover north over Red Hill (1st) a Little Ringed Plover high north over Kersall (14th) a Whimbrel briefly at Eakring Flash on 22nd and an Oystercatcher over there on 27th. The only May wader record concerned another Whimbrel flying north-east over the Red Hill area during the early morning hours of the 24th (the bird being heard to call several times during a moth-trapping session there. There was a healthy selection of rare/scarce migrants seen this Spring including 23 Whooper Swan west over Eakring Flash March 4th and a Waxwing over there on March 25th. The area's ninth Red Kite over Tug Bridge and Park Farms on April 21st, was an obvious highlight and it was the best-ever year for Merlin with several sightings of migrant birds during the period. Autumn produced a rather mixed selction of visible migration counts, with few real highlights. There was however, a very early Redwing arrival at the end of September, which caught many seasoned visible migration observers completely by surprise and a large-scale Chaffinch movement over parts of the east/south-east coast which was soon reflected inland on a smaller scale. 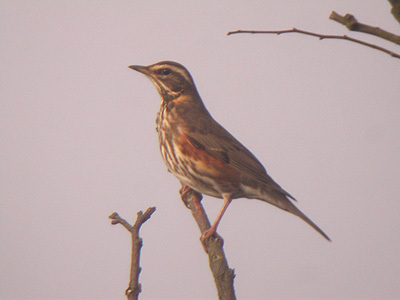 There was a very early Redwing passage at the end of September. A morning total of 1 815 west came around three weeks earlier than average. Quite often before any species moves through in large numbers, there are a few records of single birds or small groups, but that failed to occur this Autumn and Redwings duly arrived in numbers. A combined total of 2 128 Redwing this Autumn, was the area's third highest total ever. There was certainly no such large arrival of Fieldfare this year, with 696 west on October 14th being the best count, but a relatively poor one compared to most years since 1998. Blackbirds were noted and in large numbers too, following overnight arrivals on at least two dates (October 11th and 19th) but there was possibly an earlier arrival during last half of September. A count of 23 Blackbird with 15 Redwing and several Song Thrush along the old hedge at Eakring Flash on October 11th, was representative of one of the influxes just mentioned. Typically most were 1st Winter birds, whose origins may have been from northern areas of the UK rather than the continent. Certainly any hedgerows which contained Elders, all held surprising numbers of Blackbirds. An elusive 1st Winter female Ring Ouzel also frequented just such habitat with numerous Blackbirds near Eakring Flash from September 18-23rd and was the area's 8th record overall, but only the second in Autumn. Although the total of 851 Chaffinch recorded back in 2001 remains a site record, this years total count of 545 still represents the area's best ever Chaffinch movement. What makes this Autumn's movement even more interesting, was that here had never been such a pronounced westerly directional movement (birds normally south or south-east here) with many birds also moving through at height. Groups of Chaffinches sometimes numbered well over ten, with two flocks of 19 being the largest. Chaffinch groups presumably contained better numbers of Brambling than just the seven which were recorded via their flight call. A large movement of Brambling has still to occur here. The full list of Brambling seen this year include singles moving south-east, September 27th, over Eakring Flash September 30th, west on October 14th, west on October 20th; west and south-east on October 21st and south-west November 15th. Despite good numbers of Linnet in area, visible migration counts were generally low. This years Autumn total of just over 140 being the lowest ever. Both Siskin and Lesser Redpoll were noted regularly from September 15th and 17th respectively, but one of the best records of the period were the six Crossbill north over Eakring Flash on a windy August 23rd. A poor Autumn for Meadow Pipit this year, with just 431 birds during the traditional Meadow Pipit peak of September, although many may have been missed by the lack of coverage. Three Tree Pipits were noted with a single on August 25th, then two near Park Farm/Eakring Meadows on September 13th. The rarest record was the first Rock Pipit since 2000 moving south-west on October 21st. Sky Larks failed to produce any real movement at all. Throughout the Autumn, just 67 birds were deemed migrants, but there was a decent build-up of numbers in any remaining stubble fields. A group of four Wood Lark north-east over Penny Pasture Common on September 16th, was the second multiple count here. Whilst Pied Wagtail almost equalled the lowest ever Autumn migration total of 31 in 2004, a total of 114 Yellow Wagtail meant that this was the best count here since 2002. With visible migration watches producing small counts of all migrants throughout most August, it was difficult to assess whether much was actually going over at all. It was in fact, the varying numbers of Yellow Wagtails on the flooded pasture at Tug Bridge Farm which showed that many species were indeed passing through. An extremely good area count of 18 were present there on August 27th, but most days produced counts well into double figures. Among these was a juvenile which was fitted with a metal BTO ring and present on August 26th. 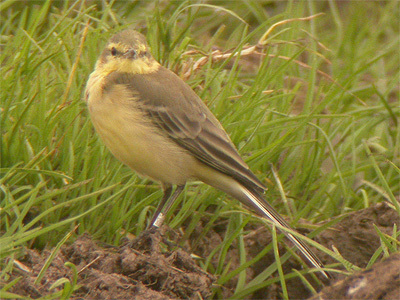 65 Yellow Wagtails moved through during August, with 45 in September. A large proportion of these coming from counts made at Tug Bridge Farm which included 17 there on the 3rd. After an extremely poor Spring. just a further two Wheatear were recorded from the area during the Autumn, near Wellow on the latest ever date of October 17th. Both birds were identified to be of the Greenland race (not surprising, given the very late date and the period of fine weather and north-westerly winds) There were two records of Whinchat in September, at Leyfields on 5th and at Penny Pasture Common, Eakring Meadows (17th) Stonechats appeared at the usual site of Penny Pasture Common with one sound on September 30th, soon followed by a pair at both Penny Pasture Common, then relocating across the road to Eakring Field Farm on October 6th, with the male remaining until October 7th. A male was then at Penny Pasture Common on October 18th. Four Stonechats was the best showing here for several years, but numbers were also noted at many other sites in Nottinghamshire. Some 43 Redstart have been recorded here over the past ten years coverage. Out of that total, 25 have come from Penny Pasture Common alone and this one site is responsible for many of the area's Whinchat, Stonechat and Redstart records. There were good numbers of Chiffchaff noted, with 92 recorded in September out of an Autumn total of 111 birds. Other counts included 65 Willow Warbler, 70 Whitethroat, 15 Blackcap, ten Lesser Whitethroat and just five Sedge Warbler. Lesser Whitethroat was another species to produce another latest ever date, when one was at Penny Pasture Common from September 29-30th. Jay produced a record-equalling 19 migrants during the period, most of which were typically hedge-hopping through the area south-west. Although there is little evidence suggesting that Jays actually migrate long distances, some form of a south-westerly dispersal does take place every year. Whilst there were good numbers of Jays recorded, hirundines produced very low counts. Swallows peaked at just 268 south on September 23rd, but Sand Martin and House Martin produced Autumn totals of just 21 and 236 respectively. 1 158 Wood Pigeon were noted throughout October and November, but most birds were recorded moving north. This was not just a local movement, but was also noticed at many other visible migration sites.